Pre-finished Baltic Birch Plywood drawer sides with rounded finished edges. Ready to be installed. Comes 7/16″ thickness and 5′ long. 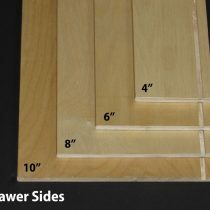 Choose from a 4″, 6″, 8″ or 10″ width.